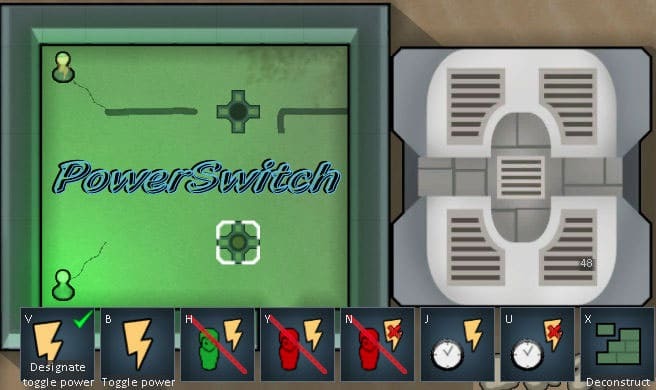 The PowerSwitch mod adds additional functions to the existing power switch. You can upgrade your switches to make them motion detectors, enemy detectors and even work with a timer. No more running to turn on the turret switch when enemies arrive! Or do want to turn off all bedroom heaters during the day while your colonists are away? Now you can do it! Pawn detection in room: detects if a pawn (human or animal) is in the room. It’s available after the normal switch research. Pawn detection within 7 squares: normal pawn detection mode for wall switches. Normal switches can be switched between this mode and the pawn in room mode by repeatedly pressing the selection button. It’s available after a specific research. Enemy detection: it switches on or off when enemies are detected within 1/2 of the map. It’s available after a specific research. Timer: it switches on or off at the specified times. It is set to on from 6h to 20h by default, but this can be changed by clicking on the UI repeatedly. It’s available after a specific research. It also adds hidden conduits with improved statistics that can be researched. Gain space by mounting lights on walls! 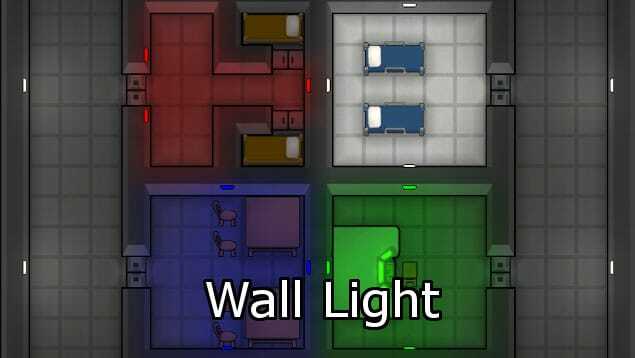 The Wall Lights mod adds a new light object that can be mounted on walls for space optimization. The PowerSwitch Mod is really practical, though it requires thorough planning. It wasn’t really useful to use switches before to, for example, turn off all heaters on the bedrooms area during the day, because you’d have to switch it on and off manually every day. But now you simply need to place your cables layout and the switch with a timer will do the rest! The enemy detection is definitely the best usage of this mod, though. Just set up all your turrets connected to the switch.